I founded AlabamaRot.co.uk five years ago, soon after the first case of Alabama Rot in November 2012. Because I lived close to the New Forest I was concerned that I would inadvertently walk my dog in an area with a recently reported Alabama Rot case. Hence I set up two maps: the Confirmed Cases and later the All Cases (confirmed, unconfirmed and suspected) Alabama Rot maps (viewed 80,000 and 480,000 times respectively). All the ‘confirmed’ & ‘unconfirmed’ cases data was supplied by Anderson Moores Vet Specialists (AMVS). 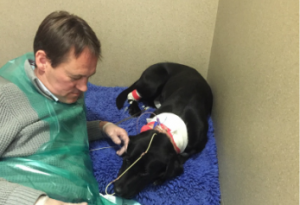 ‘Suspected cases’ by vets didn’t have kidney samples for confirmation of Alabama Rot. 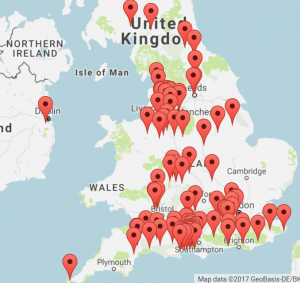 Recently, Vets4Pets have produced a map of confirmed Alabama Rot cases. This duplicates the information in the alabamarot.co.uk confirmed cases map. At a 5th October 2017 meeting with AMVS and the Alabama Rot Research Fund (ARRF), it was agreed that both the alabamarot.co.uk maps would be retired. Vets who strongly suspect a case of Alabama Rot, but have not supplied kidney tissue samples for confirmation of Alabama Rot, can discuss symptoms with AMVS. In future, the Vets4Pets map may include these ‘strongly suspected’ cases. Moreover, at the October meeting, we agreed on the closure of the alabamarot.co.uk donation fund. 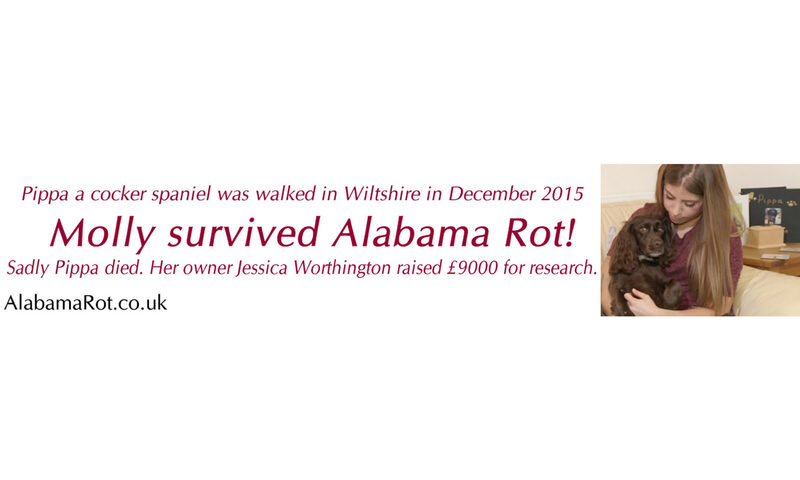 So new Alabama Rot research donors are invited to make donations at ARRF. The founder of ARRF with Lulu. The ARRF charity was set up by the owner of ‘Lulu’. She contracted Alabama Rot and survived (after Plasma Exchange Treatment). Donations to ARRF have ‘Gift Aid’ added so a £100 donation becomes a £125 donation. I’d like to thank the 40 donors to alabamarot.co.uk who have donated £800 since January 2016 towards 2012-2017 mapping and website hosting. My 2 Labradors presented with lesions within a 7 day period, my Labrador puppy then deteriorated with vomiting and lesions on the tongue and muzzle, she was transferred to Anderson Moore veterinary specialists. They confirmed she had Alabama Rot and she was put to sleep this week. The second Labrador has a lesion on her stomach and has been on antibiotics and is being monitored by our local vet and is in fluids, as yet her bloods show no signs of kidney damage. Both dogs are walked daily in woods near Marlston, Thatcham, Berkshire. My local vets confirm there was a case 3 months ago of a young Labrador dying from the disease in the same woods. So sorry to hear about your two labradors. Anderson Moores and Vets4Pets will update the V4P confirmed Alabama Rot map. Previous PostPrevious Newcastle-upon-Tyne & Cumbria: dog dies of suspected Alabama Rot.